Autolusso offers a standard service and a premium service. The Standard Service is carried out according to Alfa Romeo's service schedule. We consider this to be the bare minimum necessary to maintain your car in operational condition and adhere to warranty requirements. The Autolusso Premium Service is a more thorough service which includes using Fuchs oil rather than the standard Selenia oil, as well as a full service of the air conditioning system. 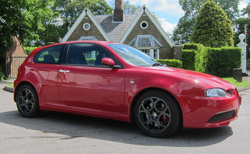 IMPORTANT – Although Alfa quote 5 years or 72,000 miles for the cambelt service we strongly recommend it is moved forward to 4 years or 60,000 miles and the table above reflects this. We advise Platinum servicing on the GTA's due to the fact they are a high performance vehicle they demand extra care and attention to keep them at their best.